One of the most beautiful of summer blooming shrubs and trees in southern landscapes is the Crape Myrtle. 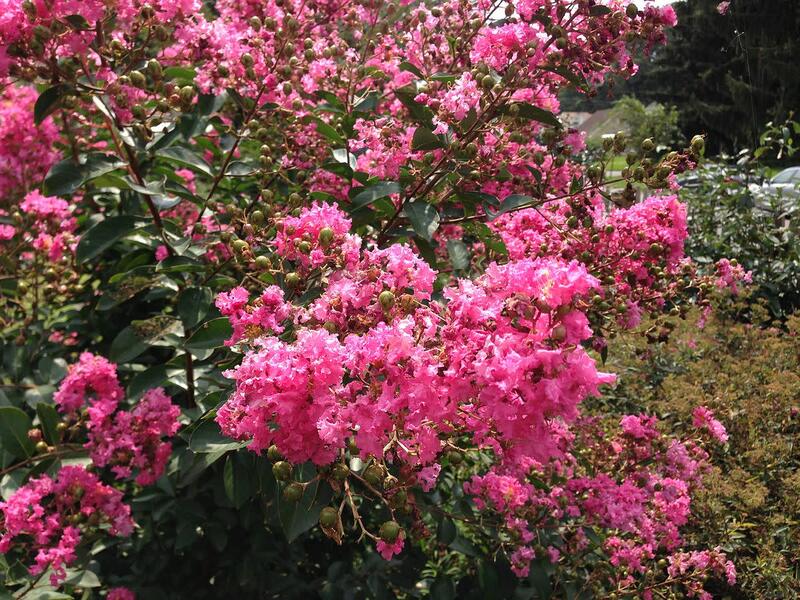 The official name of this eye catching plant is Lagerstroemia. This particular plant can be grown as a bushy shrub or as a tree all depending upon how it is pruned and trimmed. New draping varieties can even be displayed in hanging baskets. The height of the various forms vary from about 18 inches to over 40 feet. Color variations and shades of the different varieties can range from white to pink to lavender to purple and even red. 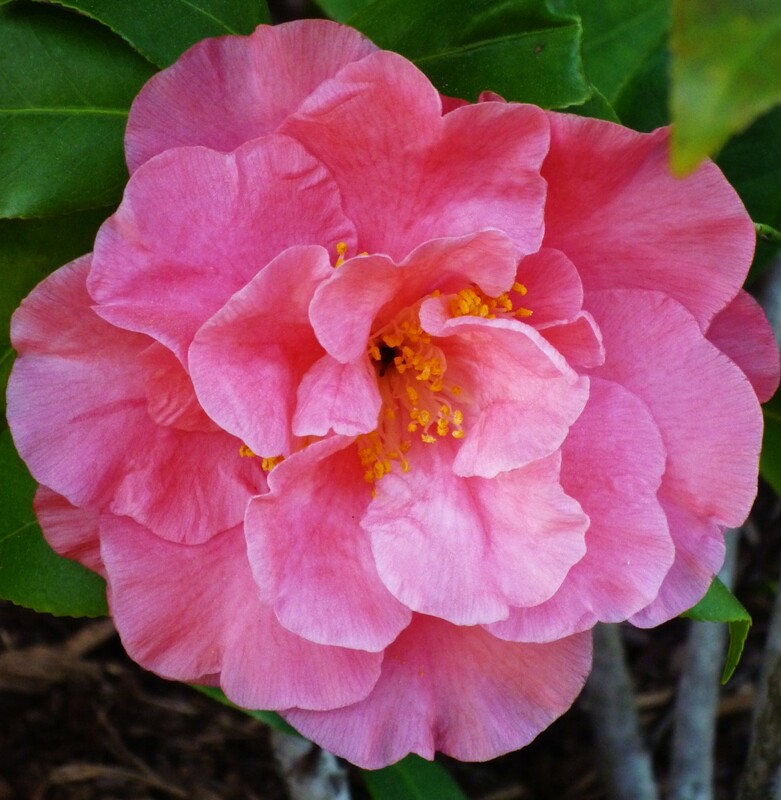 The plants thrive in hot and sunny climates so are generally seen in Zone 6 and below in the United States. 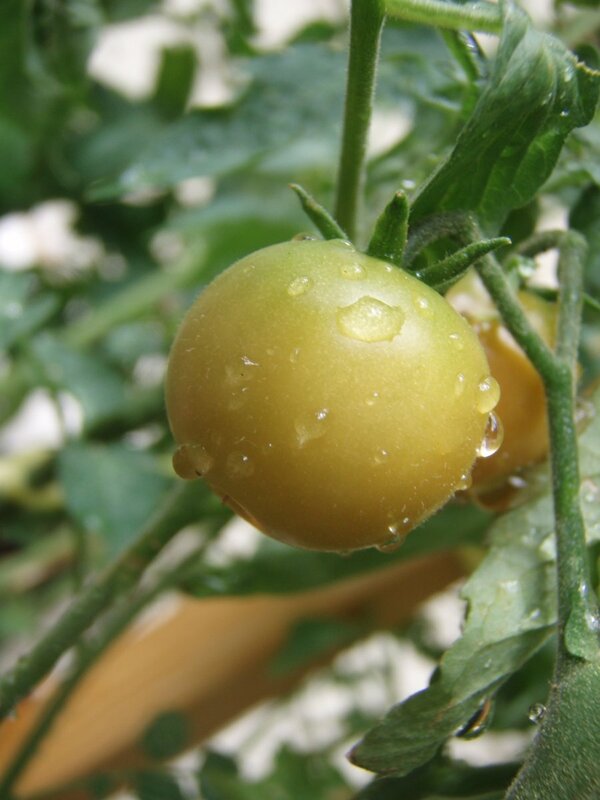 There are however newer and hardier varieties that can grow in colder climes. The Lagerstroemias are native to India, Australia and southwest Asia. 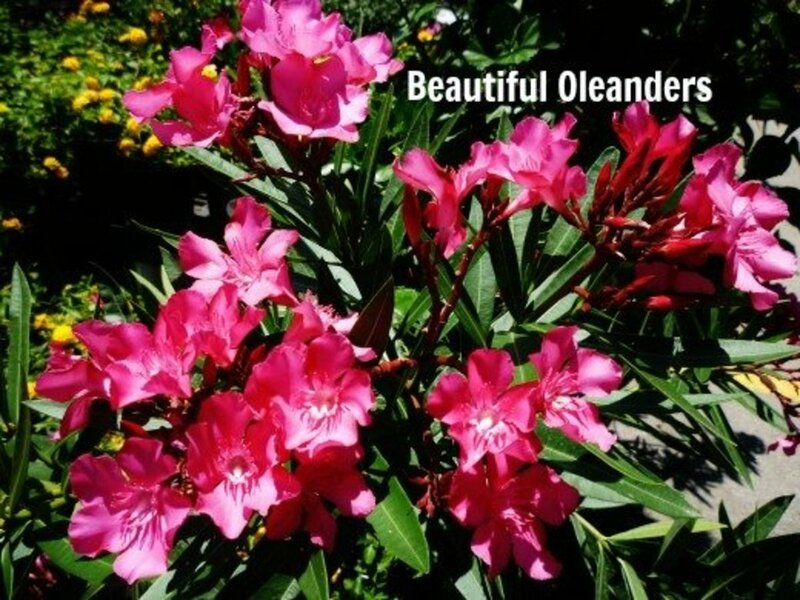 Their very showy blooming period lasts from 60 to 120 days and adds so much in the way of grandeur to yards, parks and esplanades when the right time of year arrives. Summertime here in the south is when they are at their showiest. 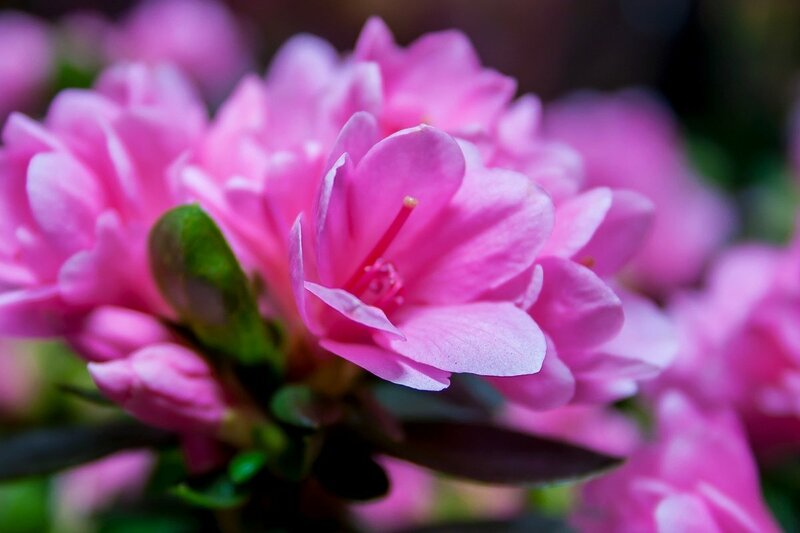 The blooming period can actually be extended if the spent flowering heads are pruned off. As the flowers develop on the new growth each year, this allows for another flower head to develop in time to reflower. We used to have two of these small trees in the front of our yard at our old house years ago. They grew fairly rapidly as most plants do in the south and produced gorgeous flowers. 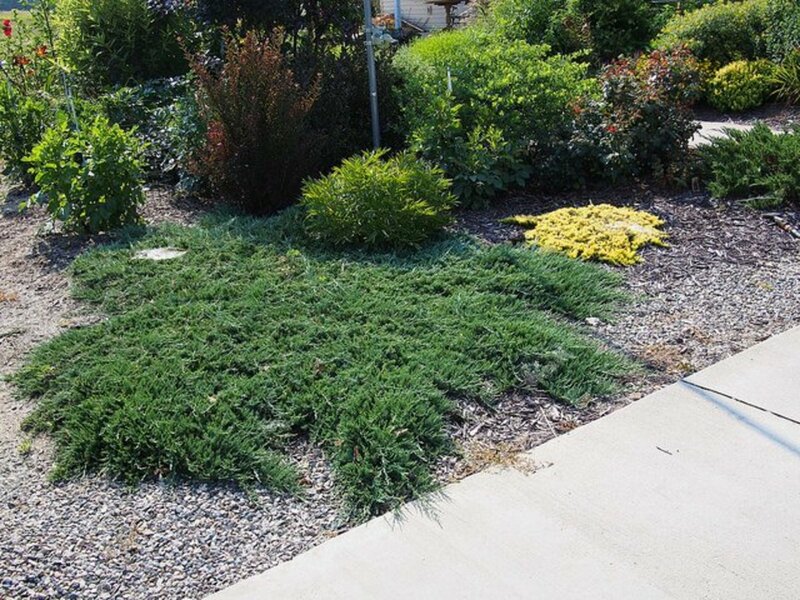 One problem we had with them and why we ultimately removed them was the constant battle we had with powdery mildew, leaf spot and black sooty mold. All of these things can occur on crape myrtles and I have now discovered how this could have been better handled. At the time I took leaf samples into a nursery and all that they told me to do was spray with fungicide every week or two until the problem was resolved. I have since learned that our plants were not pruned properly to allow much needed air flow through the branches which could have kept the problem from developing in the first place or at least minimized it. There is a good video and link describing how proper pruning can not only alleviate fungal problems from developing, but can also create a much more pleasing appearance to these plants as they grow into wonderful specimens of great beauty. 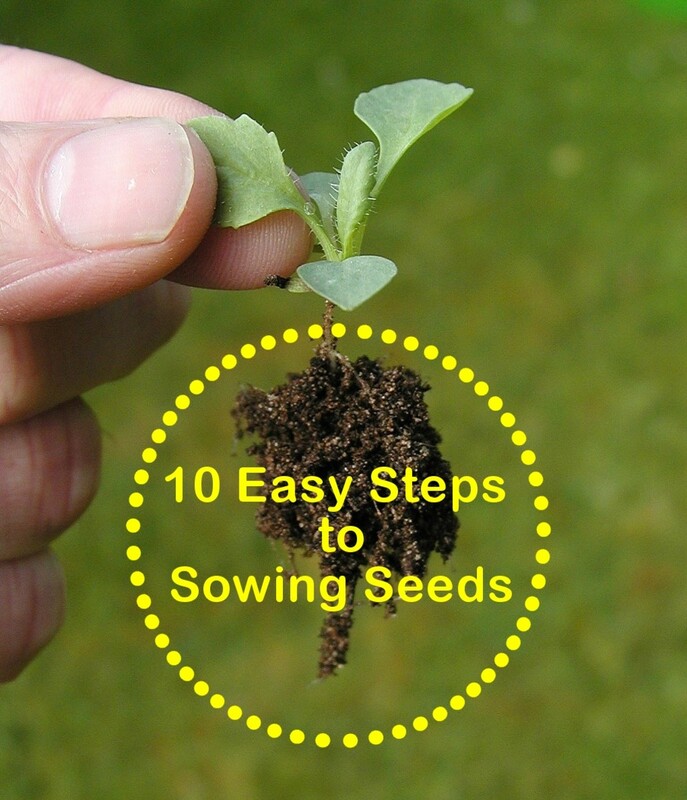 Be sure and watch the video if you are considering planting these in your yard or garden. The other thing that has happened over the course of years is that hardier disease resistant varieties have been developed. So do some homework before you purchase crape myrtles and you will be rewarded by years of flowering splendor for many months of each year. The bark of these plants keeps shedding and peeling off and what eventually results is a white-like hard stalk that is smooth and is alluring in its own right. One neighbor that used to live near my mother at her former house was cutting down a couple of her shrubs but was saving the attractive branches to be utilized as drapery rods. They would have provided not only support for the curtains or drapes but would have been focal points of beauty all by themselves. What a clever use of these eye catching hard wood branches! The photos in this post show just a few of the many brilliantly blooming types of crape myrtle. When my family moved from Wisconsin to Texas many years ago we heard someone refer to this particular plant as the "lilacs of the south." They do have a similar shaped flower head but do not have the fragrance of lilacs. If you think of crepe paper and then look at a crape myrtle blossom, you will understand how it got that name. 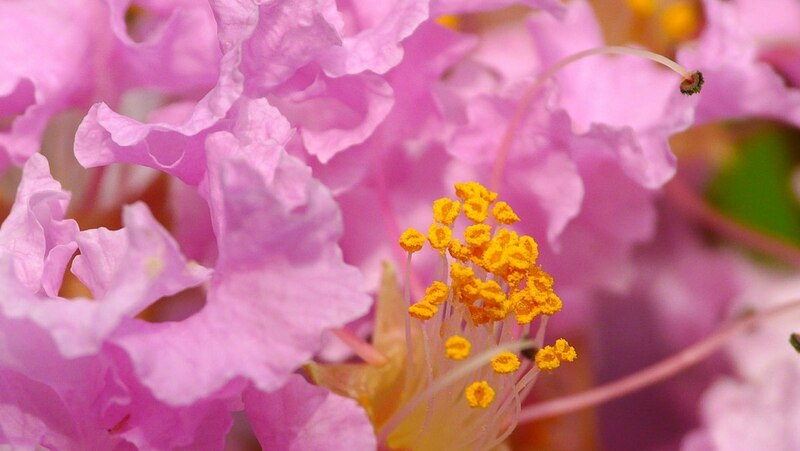 Very delicate ruffled and thin petals make up a crape myrtle flower. Landscapes all over the south are graced this time of year with the varicolored beauties in a heyday of peak color. Few blooming shrubs or trees offer so much coloration for so long a time. As the heat sizzles, these rewarding plants are at their sublime best. Do you like Crape Myrtles and do you grow them in your yard or garden? I like them but they do not grow where I live. I like them and have one or more growing in our landscape. I like them but do not grow them. I prefer other types of trees in my landscape. Location where my photos were taken. I planted a crape myrtle in our backyard last fall to take the place of our redbud tree that died. It has already leafed out and we will look forward to it growing and blooming in the days to come. Thanks for your comment and the wishes of the angels. Sending some back to you! I have always wanted to be able to grow things like my mom did. She could get anything to grow. Not me. I look at a plant and it dies lol. I did like reading your hub though and it might inspire me to try gardening again. Perhaps these do not grow in your "neck of the woods" so-to-speak. They are truly lovely in the southern U.S. when they are in bloom. 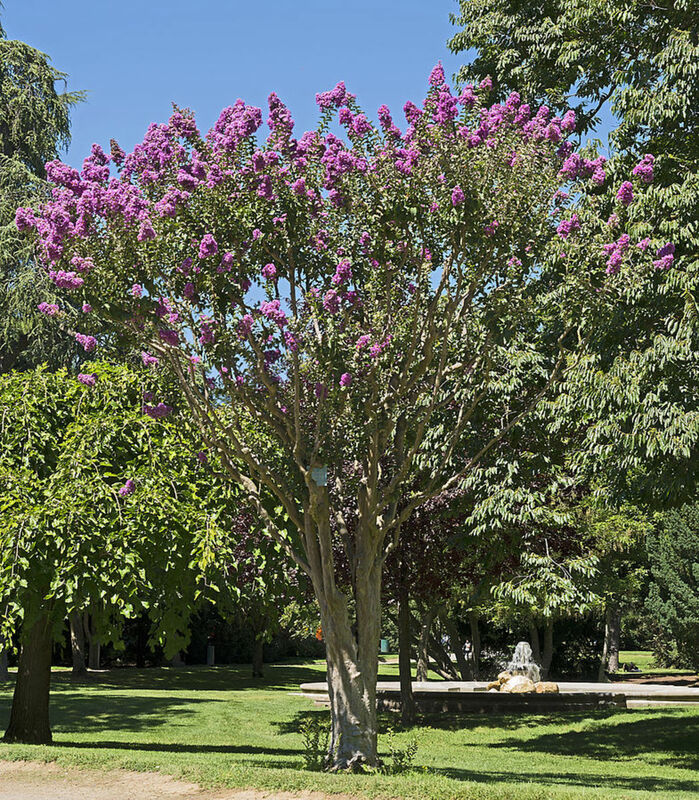 Crape myrtles look pretty much the same as they grow except that the trunk looks more interesting as it gets larger and the plant matures. I have a photo of that above. Crape myrtles are truly beautiful, particularly when in bloom. I have now planted one in our backyard to take the place of the redbud tree that died. I like the pictures. This seems a very beautiful and interesting tree. Thanks for sharing this article about the beauty of crape myrtles. We recently planted one in our backyard. The heat and the humidity during the summers in Houston really sap one's energy. They open up cooling centers around our city for those people who do not have air-conditioning in their homes. Those are what people call "the dog days of summer." I know it is hot where you live in North Texas also. Stay cool! Seems like these beautiful trees and bushes bloom continually from early spring until late fall. As you say, they are a hardy addition to any landscape. Up here in Northern Texas we rarely experience the awful humidity you get down in Houston. We do get severe humidity for a while every spring, but it usually ends by August, and even then it isn't quite as heavy or severe as you get down there. Posting this very informative and useful article to FB and Awesome HubPages. I loved climbing trees when I was young. Nice that you got to climb a large crape myrtle in your grandfather's yard when you were a young girl. If not trimmed back, they can get to be very large specimens. We don't have them at our current home either but all we have to do is look directly across the street to see them. There are many in our area...homes and businesses...just like where you live. We do have lots of crape myrtles here in Houston despite the heat. We are now experiencing temps in the upper 90's and should hit 100 this Sunday. It feels much hotter than that. Any more serious yard work will have to be on hold until Fall temps arrive. Enjoy that AC in Florida. I know we are certainly enjoying it here! Thank heavens...no hurricanes this year yet to knock out power. We could use some rain however. We are currently in a hot and dry spell. I love them! I remember one in my grandfather's yard big enough to climb when I was a little girl. We had pretty much the same situation here. Too much rain was probably the cause I am guessing. Our official high will be 100 this Sunday if the predictions are correct. We are now regularly hitting 97 to 98 with feel like temps much higher.......so we are about the same temperature wise. Not sure you have as much humidity as we do but nonetheless........it is HOT! Thanks for the share. Beautiful hub, Peggy. I love crepe myrtles. I don't have any myself, but I enjoy the ones growing around town. They are used a lot in the landscaping of both homes and businesses around here. I may have commented on this beautiful Hub before; can't remember! I always grew Crape Myrtles in Georgia, but you don't find them here. Maybe it's too hot for them. We have been in the 90's every day, but then we have a nice rain in the afternoons. The crape myrtles are just now blossoming everywhere around town. For some reason we didn't have the profuse blossoms we usually get this spring from all the different trees and bushes, etc., not just the crape myrtles. Very beautiful trees, and this article is very helpful for people who want to add them to their landscapes. Hope all is well with you and that you're staying cool. Our low temp is now 83 degrees F. The high is usually around 100 give or take a little. The crape myrtles are definitely a hardy plant. About the only problem we have with them here in Houston is if we get loads of rain and humidity and if they are planted in an area where they do not get good air circulation. The leaves can get moldy which is simply an eyesore. In dry areas, this is no problem. They are certainly showy when in bloom and the bark becomes so beautiful with age. Thanks for the votes and shares. Enjoy your Sunday! 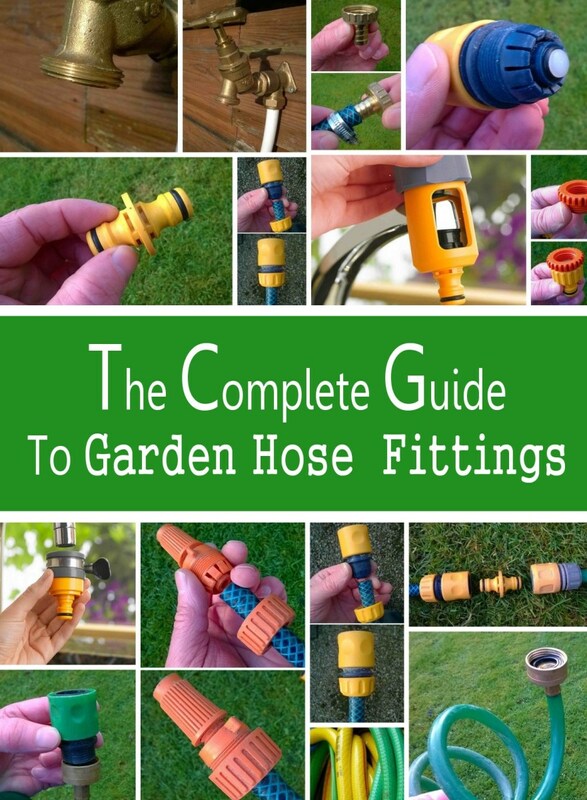 Lots of good information for people getting their yards in shape for summer. I love crepe myrtle trees and bushes. They seem to bloom several times a year and they can tolerate our awful feat pretty well. Voting this up and sharing it again on HP and pinning again, but this time to my 'Pink III' board. This article has proven to be quite successful. For those of us living in the south the crape myrtles are quite common but also beautiful. The tree branches as well as roots can be quite beautiful as they age as you saw in the one photo. Thanks for your votes and shares. Appreciate it! I can't believe I haven't seen this article before either. 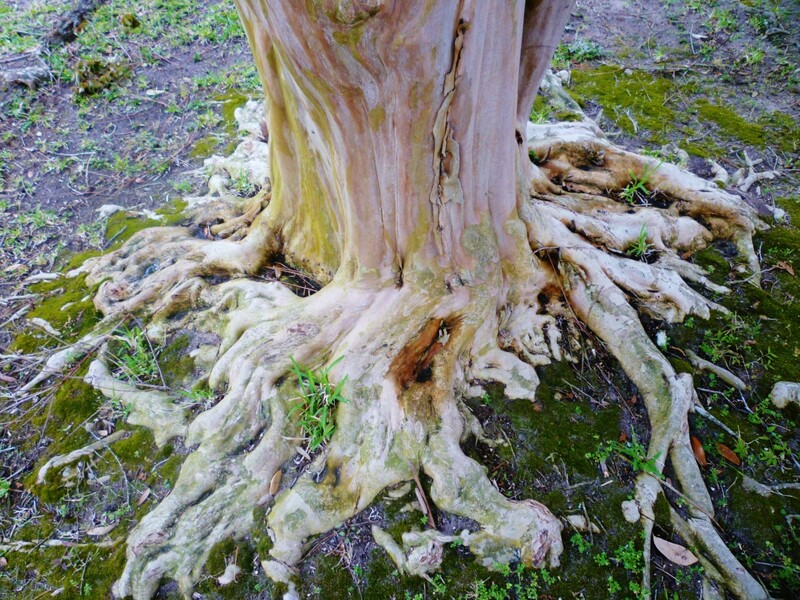 Full of good information and what an unusual photo of the roots of the old crepe myrtle tree. At least it seems unusual to me because I've never seen a crepe myrtle old enough to have roots like that. Crepe myrtles are everywhere here and I love them. They're so colorful and they blossom several times every year. They're fast and easy to grow. Gave you 5 more stars, pinned to my "Trees, Plants, & Flowers' board, voted up and BAUI, and will share with followers. So glad that you liked this hub about the crape myrtles. Appreciate your comment. Thanks for letting me know that Jessica Alba had pinned this article regarding Crape Myrtles. I still have not figured out how to know people which people are pinning articles...but thanks! I love crape myrtles, even when they are done blooming and pruned, I like the twisted limbs. I have never heard them called the lilacs of the South. That's a good name for them! Interesting crepe myrtle from Australia...the one that starts with L. So pretty! I came over to congratulate you on the pin by Jessica Alba. I can sure understand why she pinned it, very nice interesting hub. I haven't been on much so I'm kind of late with the congrats. Voted up and shared. While they may not have been native to this area, they certainly thrive down in these parts. So you lived in San Antonio for 4 years! Such a beautiful city. Were you in the military? Sorry for the late response. For some reason this went into the spam folder and I only saw your comment now. As to type of crape myrtle, if you want it to grow above your fence line, just make sure you do not purchase one of the miniature varieties. Other than that, any of the varieties should do just fine. You will have your choice of colors. Good luck! "The Lagerstroemias are native to India, Australia and southwest Asia." I live in a small townhouse with a small brkycaad. I'd like to plant a crepe myrtle in one of the corners close to the fence partly for shade, partly for having at least a one small tree in my small landscape. I am hoping that the flowers of the crepe myrtle will eventually grow above the fence line. 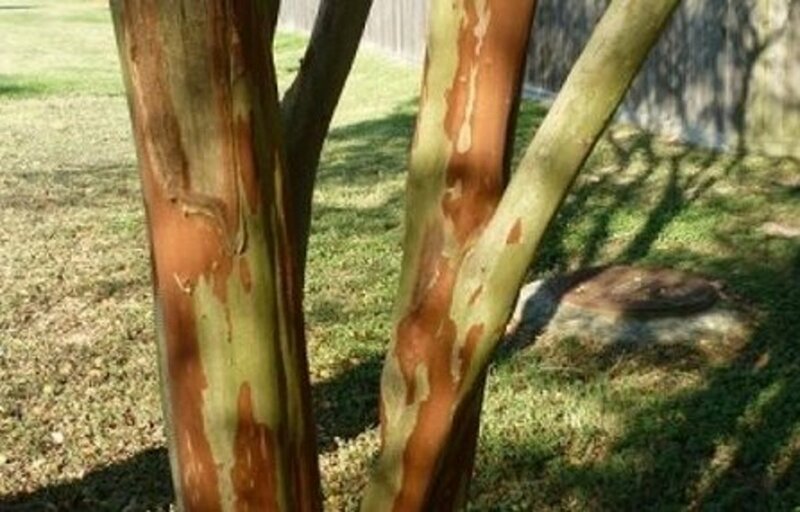 Do you have any suggestion as to what type of crepe myrtle I should plant? Thanks! Hi Jaye, Sometimes are simply mislabeled in nurseries. Nice that you are enjoying your crape myrtles even though they are larger than you expected and nice that you have memories of that hedge of them at your grandmother's place. Thanks for the votes! Happy 4th of July! You have the lovely lilacs up there that we cannot grow down here so it all balances out I suppose. Thanks for your comment and share. Happy 4th of July! When I was a little girl, my grandmother had an entire row of crape myrtles growing at the top of a hill beside a fence. I learned to love these trees then, and always will. I love crepe myrtles but can't grow them here. Voted up and shared. The crape myrtles are in full bloom here in Houston again this year on the 10th day of June. Glad to hear that yours are thriving, even if a bit later than you expected. Thanks for your comment, votes & the share regarding this hub. Peggy I love these shrubby trees that I never encountered until I came to Tennessee. I planted four of these beauties in the front yard. Two reds, a white, and a pretty lavender. The year after I planted them, I thought I'd lost them and was so disappointed, but then after everything else was already up, they sent up their new shoots and I realized they are late comers. They are definitely worth the wait. Voting up, awesome, beautiful, interesting and sharing! Everything here is also ahead of time with regard to blooming plants like the crape myrtles because this past winter flew by with very little in the way of normal winter temperatures. A few light frosts is all we got. Perhaps it is the same thing for where you live? Normally we have a little bit of freezing weather in Houston each winter. I never had to wear warm coat this past winter...just a few light jackets on occasion. Thus all the plants have been thrown off of their normal patterns with regard to blooming. Thanks for your comment and votes. We have quite a few of these specimens near our house, here in Southern California, and they're a great harbinger of spring. But they seem to bloom earlier and earlier each year. Voting this Up and Beautiful. Nice that you have the crape myrtles in your very own yard to enjoy and admire. They certainly do bloom for a long period of time. Thanks for your visit and votes. Glad that you enjoyed this hub on the Crape-Myrtles. Thanks for your comment and votes. So very very beautiful and here's to so many more to share on here. Perhaps it is not too late to do some pruning of your crape myrtle plant? Maybe just a little tweaking would have it appear even more beautiful. They certainly are a gorgeous shrub or tree depending upon how they are trimmed and allowed to grow. Thanks for your comment. Hi Peggy, I love crape myrtles! I have one in my front yard, unfortunately the previous owner of the house had not seen your pruning video :-( It is still beautiful but it could have been so much stronger if it didn't have so many branches. Thanks for sharing! 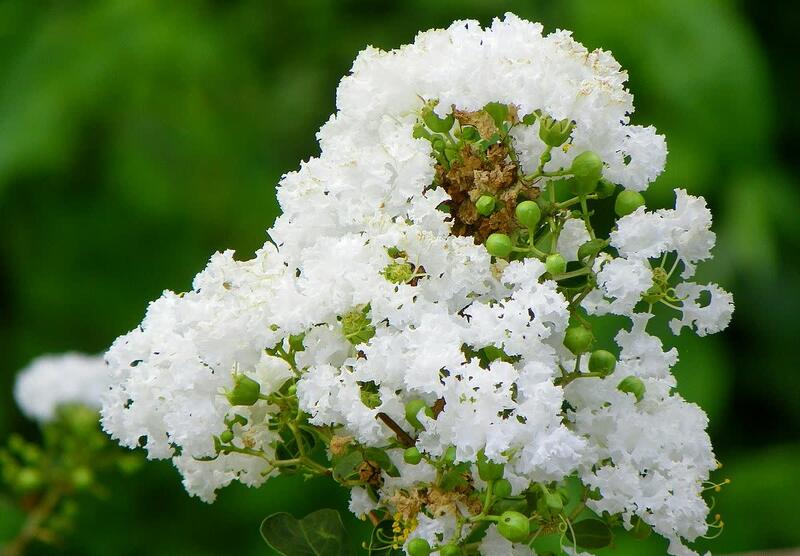 There is no reason that you cannot cut the crape myrtle blooms and put them in a vase however since that flower spike blooms for a period of time on the shrub/tree, it may not last nearly as long when cut. When the flowering is over and at that point if you cut off the dead bloom, it may actually reflower again for you. So do as you like. :)) Only wish they smelled like the fragrant lilacs! Thanks for your comment. We just planted a crepe myrtle tree in our front yard next to the driveway to bring in a bit of color. I will definitely watch the video before it is pruned! Do you know if the flowers can be put in a vase like a lilac? I'm very excited to see it grow and bloom, even more so now after reading your Hub! So happy to hear that you enjoyed the pictures and information about crepe myrtles as they are used in Southern landscaping. They are still blooming in Houston and it is now October. Thanks for your comment and votes. Peggy, another wonderful article with so much useful information and great pictures. It is always great to come over and get away for a few minutes. You capture everythings true beauty. You have my votes. If you have more room in your yard, this might be a good time of year to purchase some bargain priced crepe myrtles. Most of the plants in the nurseries down here are greatly discounted this time of year. Thanks for your comment. Great article. Crepe myrtles line some of our neighbor's driveways. I love the canopy they create and the beautiful colors they bring. I have only one Crepe Myrtle bush in white but would love to have some of the trees in the brighter colors. That is a surprise that the crape myrtles do well in Pennsylvania. Am sure that more people up there will want to try growing them after reading your comment. Are they in a protected environment? Up close to a house or sheltered in another way? Nice that you can enjoy them as we can down here in the South. Thanks for your comment. Thanks for a most informative video. 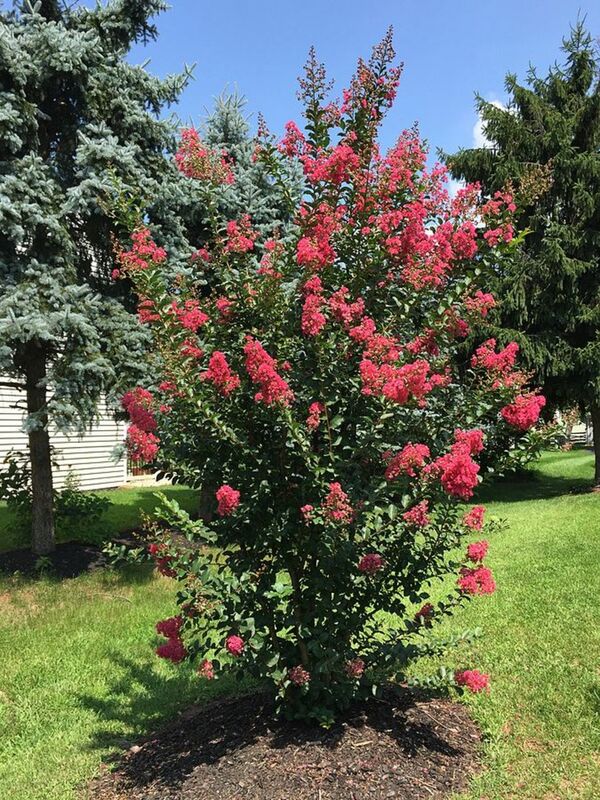 I'm from Northeastern Pennsylvania (zone 5A or 6) where crape myrtles are not supposed to grow! I loved them so much on a trip to VA beach that I thought I'd try. I now have 4 and all are doing well. My pink one is about 7-8 ft tall, the others younger and smaller but thriving. Sure was worth taking a chance. Wonderful hub, Peggy. I have always loved Crape Myrtles for the fabulous color and length of flowering stage. We've had them in N. California and, now, in SE Kansas. Even with the incredibly cold, freezing temps. of winter, these beautiful shrubs and trees grow back...even if the shrub variety has sustained dieback to ground level, they return...trees do well, too; much to my amazement. You've pointed out an excellent bit of information; to avoid fungus, mold and mildew, we must trim the dead and extra growth back to allow air flow. When my friend, Al, first suggested this to me; I thought he was a little wacky...then, of course, I realized he was right. We also "deadhead" the spent flower tops so that a second growth can occur......extending the length of flowering even more. Haven't tried fashioning a curtain rod from branches, though...good idea, however. Thank you for a very good and beautifully presented hub! UP Beautiful, Useful, Awesome and Interesting. Crape Myrtles do not have fragrance like lilacs do. I used to love the fragrance of lilac shrubs when we lived up north. 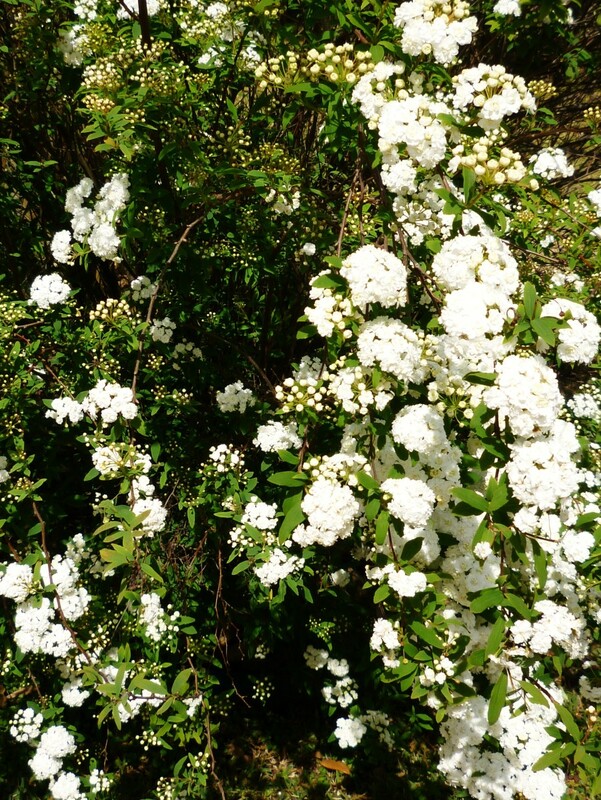 My parents had a hedge of them when I was a child and I still remember their wonderful smell. Unfortunately they do not grow down here in Houston. The upside to the crape myrtles compared to lilacs is that they bloom for a much longer period of time. Be sure and take your pillow when you go outside to "sleep in the flowerbed!" Haha! Thanks for your comment. Thanks for the compliment on this hub about using crape-mrytles in southern landscaping. Do you use them where you live? This web site is actually genuinely intriguing. You deliver way up a few terrific points regarding the post. That is definitely my personal first time here within this kind of web site so good job. Peggy, beautiful pictures. I love crepe myrtles, we have several in our yeard. Great information. Nice very nice i really like this hub. You have really been busy reading hubs! Glad that you liked this one about Crepe-Myrtles in Southern Landscaping. I also like the pink ones. Thanks! Absolutely beautiful. I love the bright pink..
Peggy W, Nice informative hub! The Crepe Myrtle beautifully enhances any landscape! They are so colorful when blooming... Thank you for sharing, Peace & Blessings! I know why you like live oak trees better than the crepe myrtles and that is because they are the homes to your squirrels. Right? They surely love the live oaks (and water oaks for that matter) in this area! Thanks for the comment. My favorite tree is without doubt, the Live Oak. I'm trying to think of another I like more than the Crepe-Myrtle but nothing comes to mind. Thank you Dear Peggy! Thanks for the comments on this Crepe Myrtle hub and also for letting me know that I left off the comment box in the Bradford Pear Tree hub. I just corrected that! Good luck with your pruning of your crepe myrtles in the future. They are such a beautiful tree/shrub...depending upon how they are grown. Crape Myrtles are my favorite ornamental tree and I have several in my back yard that have bloomed profusely in the summers. I've looked up pruning information in the past, and pruned mine the best I can, but the pruning video you embedded in this hub will be very useful in the future. Your landscaping hubs are always so informative and beautiful. I also read the newest one on the Branford Pear trees and loved it, but couldn't find a comment box. Thanks for sharing your wealth of knowledge. It depends upon where you live. Here in Houston plants tend to grow really fast with the warmth and humidity. A five gallon sized plant would be very large here in a couple of years. You could probably check with some local nurseries and get their opinion. Personally I have never purchased really large plants because in a few years time, the smaller ones seem to be almost equal in size and the money saved can be substantial. My former next door neighbor purchased a large tree for hundreds of dollars and had it planted. We planted a 5 gallon sized one (both oak trees) and within 3 years, muchless 5 years, there was absolutely no difference in size. Hope that this answers your question. Good luck on planting your crape myrtle! If I wanted to make sure the Crape Mertyle is a prominent fixture on the corner of my house within a couple of years, how big would it have to be when I plant it. 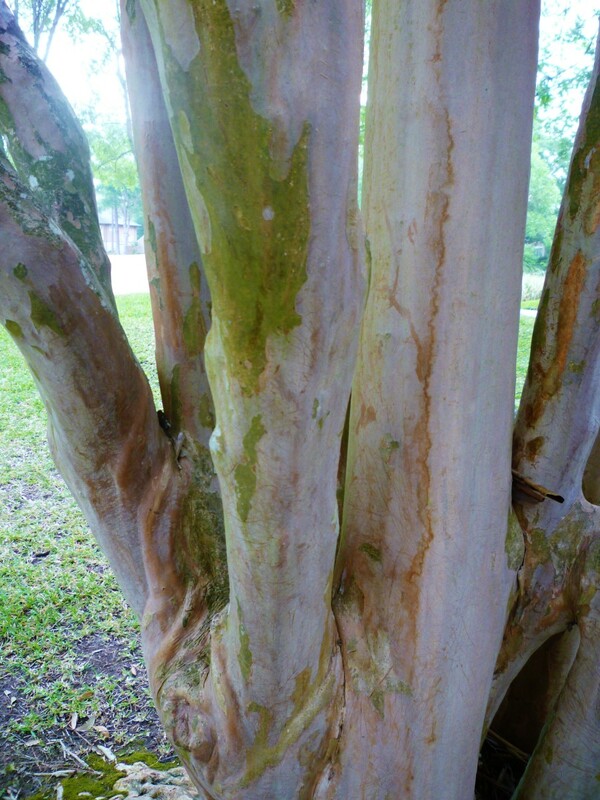 The main problem with Crape Myrtles in our area is the mold which can form on their leaves in Houston's humid environment. That being said, most of them seem to thrive and certainly add beauty and color to the landscapes. Currently we have none in our yard but enjoy the ones in neighbor's yards. You are fortunate to have crape-myrtles in your yard. They are beautiful indeed! Beautiful! I have a few of these in my yard. I agree that Crape Myrtles are beautiful. You are fortunate to have one of your very own in your front yard. What color is it? Crape Myrtles are beautiful! I have one in my front yard. Wow! A visit from someone in Australia! Thanks for visiting my Crape-Myrtles in Southern Landscaping hub. The pictures are awesome have tried to create such magic but to avail will keep visiting our hub as it is highly informative along with visuals. Crape Myrtles are pretty and I learned more about them than I knew previously by doing this hub. Thanks for the comment. Glad that you can also enjoy these beautiful crape-myrtles with having one in your very own back yard. They certainly add beauty to southern landscapes! Thanks for leaving a comment. Great information! We have one in our back yard & it is so pretty! "thanks a lot it is so colorful....thanks again......"
Crape Myrtles are beautiful, I'll admit. Perhaps there is too much humidity in Florida? I still miss the wonderful lilac bushes that grow up north. Guess we can't have everything! Thanks for the comment. Peggy- How I miss crape myrtles! Now living in south, south Florida that just do not do well here. Great photos as well. What a glorious view you must have of your bank of pink crape-myrtles in your backyard landscape. They are truly the "lilacs of the south." Enjoy that coffee! Thanks for the comment. We have them all over the backside of property - All of ours are pink - Love looking at them while sipping our coffee on the back patio each morning. Thanks for the compliment on my Crape-Myrtles in Southern Landscapes hub. Hope it offered information that you can utilize. Also thanks for the comment. So happy if this hub about Crape-Myrtles in Southern Landscapes will be a help to your new planting efforts. Thanks for taking the time to leave a comment. What a great hub! Thanks for the advice about mildew. We've been thinking about Crape Myrtles for our yard, but have serious issues with mildew. Know I know what to look for when shopping for a new tree.